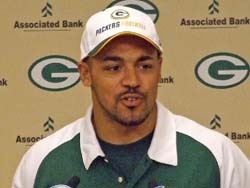 The Green Bay Packers signed veteran linebacker Nick Barnett (pictured) to a six-year contract extension. According to reports, Barnett is set to earn $35-million over the life of the contract, with roughly $12-million paid out to Barnett in the first year of the deal. Barnett originally had one year left on his current contract, set to pay him $1.95 million. The deal means Barnett stands a good chance to retire as a member of the Packers. He has led the Packers in tackles in three of the last four seasons.